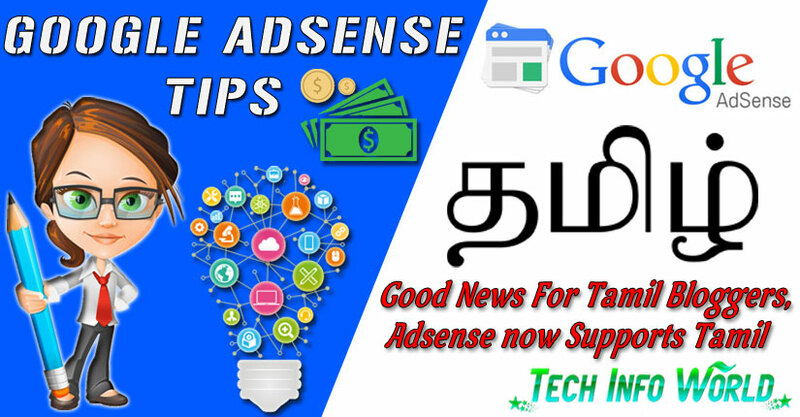 Adsense now Supports Tamil, Good News For Tamil Bloggers. In previously Google Adsense will not support the Tamil language, February 9, 2018, Google Adsense officially announced the Tamil language is also one of the acceptable languages in Google Adsense. Now, Google AdSense will provide one of the easiest ways for publishers to monetize the content they create in Tamil, and help advertisers looking to connect with a Tamil Speaking audience with their relevant ads. Check the official post announced by the Google Adsense on his Google blog through this link. Most of the Tamil bloggers now really happy about this language accepted by Google Adsense. Nowadays most of the Tamil speak audience increased day by day to using the Google search engine to get more valuable details and search the Tamil news website to get interaction to the google. I hope that’s why Google will decide to accept our mother tongue language. Its one of the best news to hear all the Tamil content website bloggers. Most of the Tamil Advertisement companies also increased daily to advertise his client’s website ads and much more relevant ads to the Google Adwords to improve the performance of his websites. Check some articles I have previously explained about How to Create Adsense account, Create Ads Units, How to Upgrade Adsense Account. You just need to check the Google Adsense Guidelines and its Policies, it really helps you to get the Google Adsense approved account easily without any rejected or any policy violations. Make sure your website fully qualifies for the Google Adsense Approved program policies. At last, Create the New Ad unit in Google Adsense account and Add the Adsense code on your website to start to display relevant ads on your website. Thanks for sharing this useful information. This is good for Tamil Bloggers. Hi, Anto navis. Very informative post you have written. Now Adsense Support Tamil language,it is very good this. it helps native Tamil bloggers to monetize his blog. Brilliant article and one of the most informative article how we can measure our progress, I’ve ever read. Thanks for sharing this informative articles. wow, thanks for telling I was so frustrated to use other ad serving sites, most of them are spams.